pinku: Lip them! Lip them off! Lip them! Lip them off! I was thinking of ripping back the toe of the first sock and using that yarn to finish up to the toe of the 2nd sock and then using another colour to knit the toe, but I think I'm just gonna rip the entire first sock and reknit it with a shorter leg. To be honest they are a super quick knit, but it's still pretty depressing. But moving onto more exciting and happy news, we're more than likely going to the USA for Thanksgiving (my first real one) - woohoo! 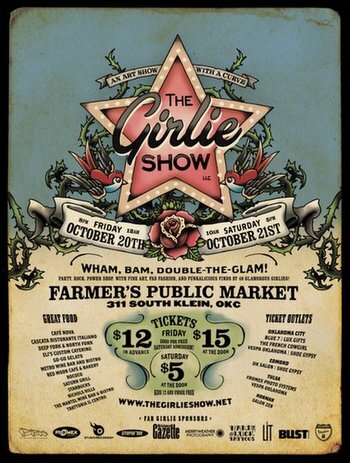 I'll finally get to meet the talented Erin, one of the organizers of the fabulous Girlie Show in Oklahoma City. If you are nearby OKC this Friday and Saturday be sure to check it out! I have more to write, but I'll leave it there for today. I have a tendancy to write about seven posts in one. It's just that I have so much information to share with y'all. Oh and did I mention that I cracked and purchased a kit from here!!! Nearly finished it actually!! Lip my stockings! LIP them!! 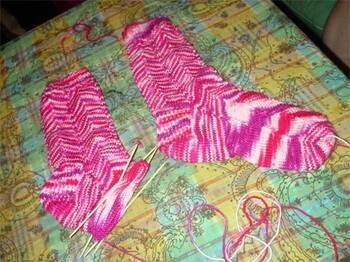 Running out of yarn is my biggest fear when knitting socks. I've started doing all of my socks from the toe up. I'm so paranoid about it that I'm planning to bring all of my 100g balls of yarn to the office where I can use my fancy schmancy pharmacy scale to divide them into 50g balls. Sorry about the yarn. Is it a colorway that they have often? Because Rhinebeck is this weekend...and they'll have Socks That Rock...let me know! Jaywalkers just eat up yarn! 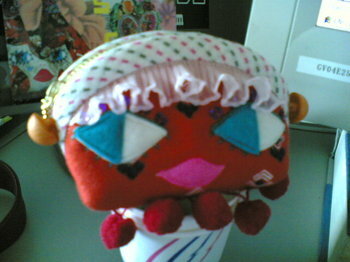 I ran out, too, but luckily I'd made the legs pretty short (but still ran out). to answer cara's question, it's the old put up of STR that i bought at rhinebeck last year so it has less yardage than the STR that they currently offer :( bummer. i'm sad you'll have to rip back.. but the colors are lovely! as i expected them to be. i was just thinking about how last thanksgiving we spent at your place and what a rocking good time it was :) this year will be tough.. it definitely won't beat hanging out on the tatami, drinking beer, and being with good friends. Thanks for the props, my friend. I can't wait til you two get to Oklahoma City!!! I'm so pumped. Okay - it doesn't matter if it's the 325yd put up. I made like 8 pairs of Jaywalkers with that put up. In fact all of my jaywalkers were made with 325 yds. And like I said, I only ran out like twice. And once was because I added repeats. We'll get this to work. No fear. Oh no, bummer. Hope you get your socks under control without having to rip it ALL! And yay Thanksgiving! I bet you'll love it. I'm going home too, it'll be here before we know it! OH, that's a bummer! At least you were able to get through them. My jaywalkers are sadly sitting in the bottom of a basket waiting to see the light of day. Ray Ban Jackie Ohh on Tachiyomi shimasen ka?